This latest version reflects changes made by Council at the March 12, 2018 Council meeting. Click the links below to view the Water Master Plan Final Draft – November 2017 and Appendices, that Council considered at the November 27, 2017 regular Council meeting. The District of Lantzville is updating our Official Community Plan (OCP) to help set directions for the community over the next 20 years. At the same time, we are also developing a Water Master Plan to guide decision-making for our water service. Your input is central to defining what that future will be! Please join us at our final OCP Workshop to review and provide your feedback on the First Draft OCP UPDATE! Your feedback is important as we work towards finalizing the OCP Update. *Due to room capacity, we have scheduled two workshop time slots. The content presented in each time slot will be identical. Please attend the workshop at the time that is most convenient to you. Please arrive 10 minutes before the workshop start time. Building fire capacity may limit latecomers. What's happening at the Workshops? The Draft OCP will continue to be refined as it receives public, Committee, and Council input. A First Draft (dated September 27, 2017) has been reviewed by the OCP Review Select Committee - please note the recommendations from their October 18, 2017 meeting which accompany the First Draft OCP. 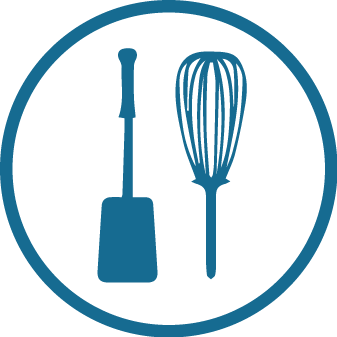 Both the First Draft OCP and the OCP Committee recommendations for changes will be tabled with Council, released on the website, and reviewed with the public at the November 9, 2017 workshops. After the public input has been collated and considered, the OCP Committee will finalize its recommendations to Council and a Second Draft OCP will be produced for Council and agency review. Further refinement into a Third Draft is likely, prior to entering the formal public hearing process in the New Year. The response form and draft OCP document will also be available online for review and feedback between Thursday, November 9 and Sunday, November 19, 2017. We look forward to an interactive discussion on the OCP Update. The Community-wide Survey closed on Friday, April 7, 2017. We would like to extend our sincere appreciation to everyone who took the time to complete a survey ¡V your responses have provided valuable input to the Draft OCP Update and Draft Water Master Plan. 543 completed surveys were returned. Click on the link below to view the Community-wide Survey Summary. Thank you to everyone who joined us on Wednesday, January 18, 2017 at Costin Hall to consider short-list land use options for the Village Core, potential development areas, and the community as a whole. Your input is being used to refine the questions that will be brought forward in the Community-wide Survey. 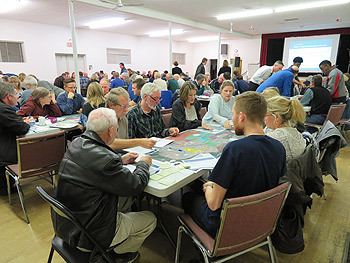 From November through January, several Lantzville residents opened their doors to neighbours and facilitated in-depth discussions about future ideas for Lantzville. Thank you to those who hosted and participated. These meetings provided a wealth of information with participants delving deeply into ideas and discussions for their neighbourhoods and the community. Input from these meetings has been used to develop short-listed land use and water servicing options and preliminary policy directions for the community. At the start of November, over 100 residents participated in a Community Workshop to discuss Lantzville's OCP Update and Water Master Plan. We heard fantastic feedback which was used to refine the options brought forward at the Kitchen Table Meetings. 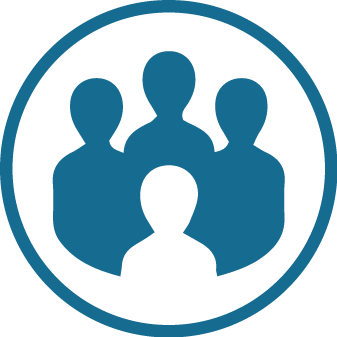 An initial community questionnaire was open between September 12 and September 23, and November 2 and November 22, 2016 to gather feedback on the current OCP vision, directions, and progress, as well as community water service issues and concerns. A total of 221 participants responded. 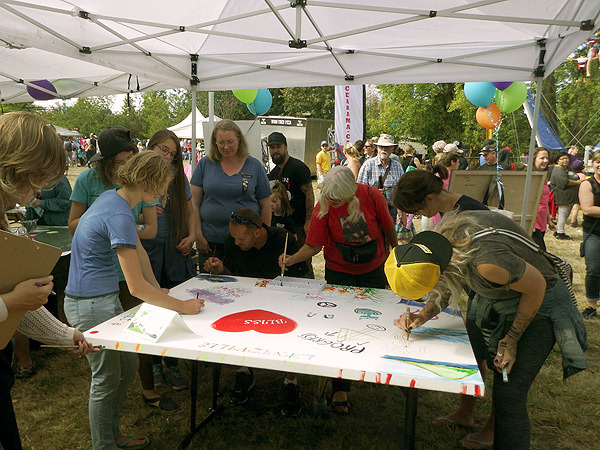 Thank you to everyone who stopped by our booth at Minetown Day and those who took the time to complete a community input questionnaire, share your ideas on the big map, or paint your Lantzville of the future. We appreciated hearing your thoughts and concerns about the future of Lantzville. The diagram below shows the stages of the process and identifies opportunities for you to be involved. OCP Map No. 3 Natural Hazard Areas Note: Takes a few minutes to load. For more information about the OCP Review Select Committee, click here to visit the OCP Review Select Committee page. 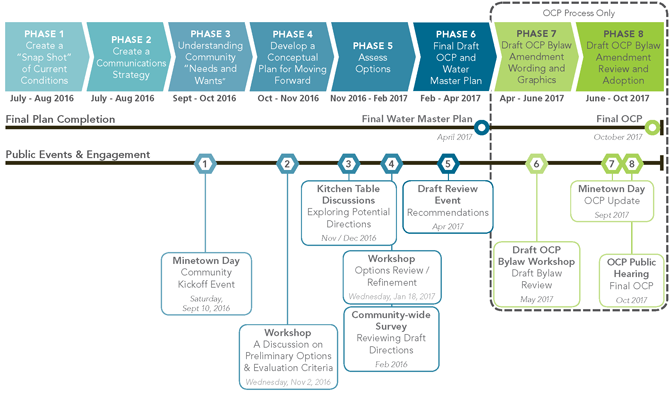 Questions about the OCP Update or Water Master Plan? Register below to receive email updates about upcoming events and announcements about the plans.